It is hard to believe that summertime is, all too quickly, fleeting and pretty soon schools will be back in session. Despite how I may have felt several years ago when this time of the year approached, I now find myself longing to go back to those days when everything was still new, fresh on my mind, and exciting. It was in those days that I could take the things I saw written in my textbooks and use them for the first time. Every chance that was given to utilize a new skill in a clinical setting was done with such rigid precision and mindfulness of written text. At the time it was terrifying, but now I catch myself yearning for those moments of acquisition. Fortunately, the medical field is always changing which allows an opportunity for new skills to develop all the time. The only difference is, sometimes the onslaught of new information can push the ground work of your professional skills to the very back of your mind. For this reason, I ALWAYS keep my textbooks close by. I have never gotten tired of turning to those resources and replenishing my mind. I have a feeling I'm not the only one! In my opinion, if you TRULY love what you do, then it's close to impossible to feel like you have "learned enough"
This post was created based on my most recent desire to flip through the pages of my Child Life textbooks. I found that I was refreshing my memory on so many things and it started to fulfill that sense of longing I had to be back in school again. I decided to refresh myself on the topic of Assessment. This is a monumental part of ensuring the most effective care for children and their families. This chart represents the idea of stress potential assessment. The chart is based on the research discussed in "Psychosocial Care of Children in Hospitals." Gaynard (and company) layout the steps it takes to effectively determine how a child and their family may react to their particular hospitalization. Once all of these factors are taken into consideration and properly assessed, the CLS rates the child on a scale of 1-5. 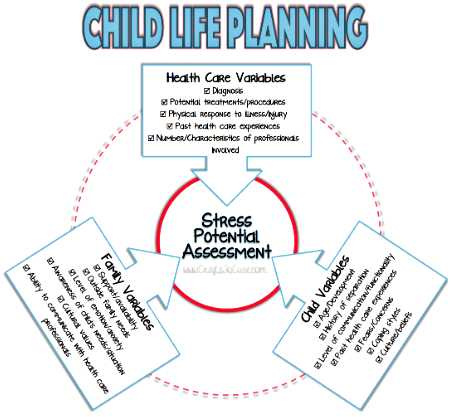 Based on the outcome of the assessment, Child Life Specialists are able to develop the appropriate plan of care for their patient and patients families. This tool will also act as useful information to the rest of the healthcare staff, and will be referenced and reassessed throughout the patient's hospital care. 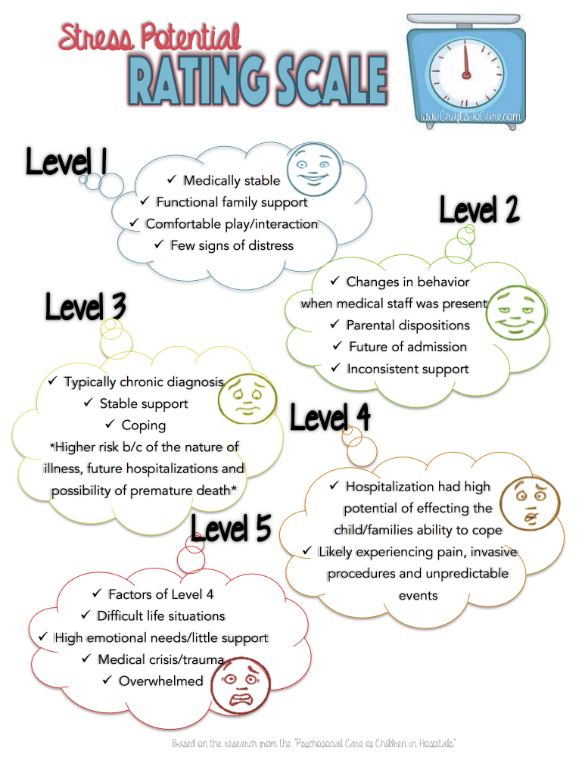 The rating can also change in either direction if/when there are any new developments in the child's state of health, emotion and/or support system. Another reason the Stress Potential Rating Scale comes in handy is for properly prioritizing and management. This scale helps make the often tough decision of who needs our services the most. I hope the rest of your summer is filled with the most sunshine, simplicity, and silliness! Do you always have this with you in your work? Or do you have it memorized? Do you have these documents? If so...could you email them to me?